This is one great steak. 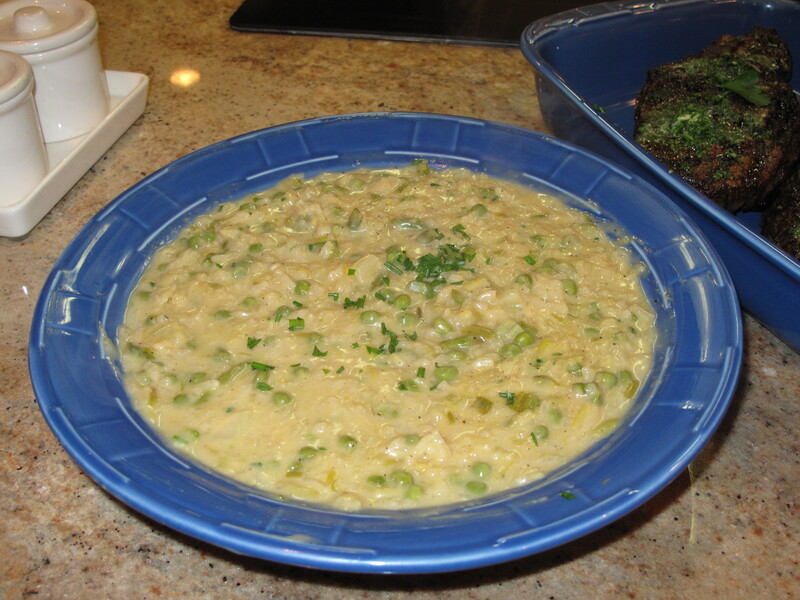 Last week, all of us here at Acorns On Glen made a delicious Spring Risotto and then shared the recipe. 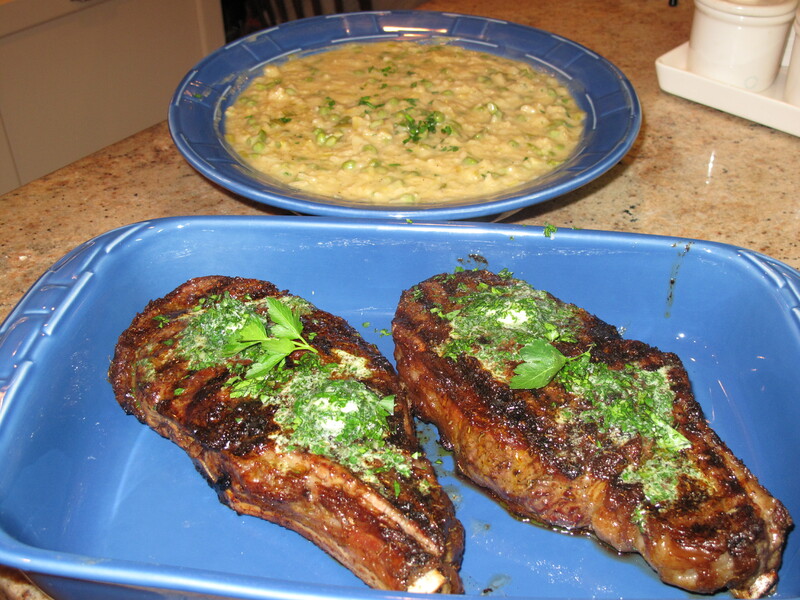 At the same time we made the risotto, we also tried an Emeril Lagasse steak recipe that guaranteed an end result that is as good or better than a real steakhouse ribeye. It was beyond fantasic! Using the Emeril’s seasoning, some great ribeyes from our butcher, the butter topping and a combination of grilling and roasting made for one delicious night of eating. We used a grill pan on top of the stove for the grilling part and then our convection oven for the roasting part. As you know, I am not a big citrus fan in the cooking I do. The compound butter recipe called for some lemon juice, but I omitted it. If you like, you can put one tablespoon back in the recipe. If you are a steak lover (and I think most of us are), you have to try this “to die for” recipe. In a small bowl, whisk together oil and Emeril’s Original Essence to combine. 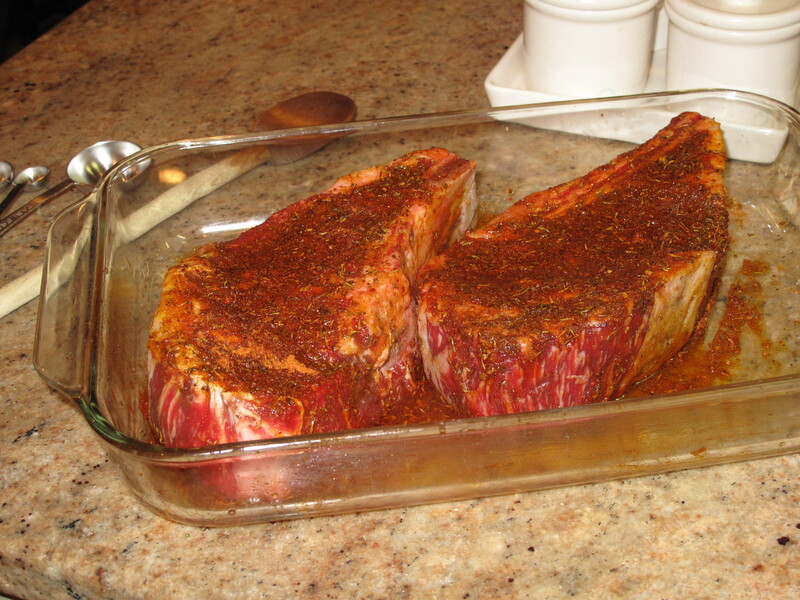 Rub oil mixture all over steaks and place in a shallow dish. Cover dish with plastic wrap and refrigerate at least 4 hours and up to overnight. Bring steaks to room temperature 30 minutes before ready to cook. Preheat a grill pan to medium-high heat. Preheat oven to 450 degrees. Place steaks on grill pan. Cook, turning once, 4 to 6 minutes per side. Transfer steaks to a large ovenproof skillet or baking sheet with a wire rack inserted into it; transfer to oven and roast until internal temperature of steaks reaches 140 degrees on an instant-read thermometer, 3 to 5 minutes. Remove steaks from oven and set temperature to broil. Place a slice of butter on each steak; transfer steaks to broiler and broil until butter just starts to melt, 20 to 30 seconds. Serve immediately, garnished with parsley. Place all ingredients in the bowl of a food processor; process to combine. I just put softened butter in a bowl and mixed it together with a fork. I didn’t think it was necessary to dirty the food processor. Transfer mixture to the center of a large sheet of plastic wrap or wax paper; form a log about 1 1/2 inches thick. 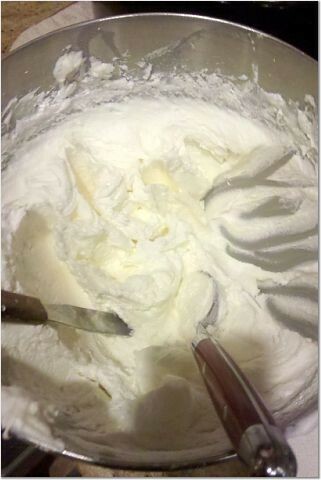 Fold the wrap over the butter and gently roll to form a smooth cylinder; twist ends to seal. Refrigerate until firm, at least 1 hour and up to 1 week. Butter can be frozen for up to 1 month. Doctors tell us that eating steak everyday is probably not the greatest thing for your health. Everything in moderation, right? So when you do allow yourself the treat of steak, try this recipe. You won’t be sorry. What is your favorite recipe that you can share with us at Acorns On Glen? This is Friday, February 25, 2011 and it’s time for another edition of Friday Dance Party here on Acorns on Glen. As we did at our very first dance party, let’s start by being thankful that we’ve survived another week….did you do that?….OK, good. Let’s dance! I received a few comments and some emails on this week’s selection. However, it was my mother that led me to this track. She said that everyone needs a little rock and roll in their lives no matter how old, so in her honor, I’ve picked a classic Elvis tune to take us into the weekend. Elvis is my mother’s all time favorite artist. In her day, my mother and several other girlfriends used to listen to Elvis in private so that their parents and other “straight-laced” friends wouldn’t know. They practiced and did his moves and when he became the “King” they were ready. On the dance floor after Elvis became popular, all the secret Elvis admirers were at their best. Everyone asked them to teach this or that Elvis move. Needless to say, they never lacked for a dance partner after Elvis was accepted. So let’s dance, let’s learn some Elvis moves and hope that we never lack for dance partners again as well. What do you want to hear on next week’s Friday Dance Party? A Toadstool Tea is a secret party for all the fairies, elves and imps to celebrate the Fairy Queen’s birthday. It takes place under the thicket deep in the middle of the forest. Since we don’t have a forest where we live, we will substitute our big party room instead. We will do our best to make it look like a forest. Directions: Arrive for 2 hours of pottery painting and a Toadstool Tea. 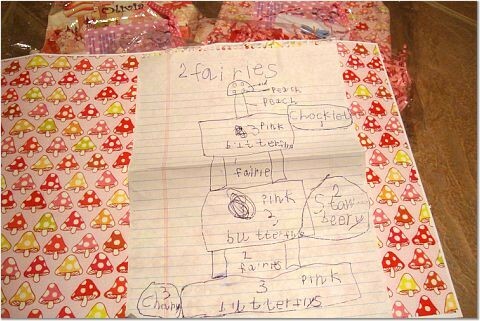 Bring the enclosed fairy or toadstool apron so you don’t get paint on your fairy clothes. I am also enclosing a magic token that you can use for the carousel. If you close your eyes and wish really hard, the magical animals on the carousel will transport you to a secret fairy land. Here is a picture of the finished product. 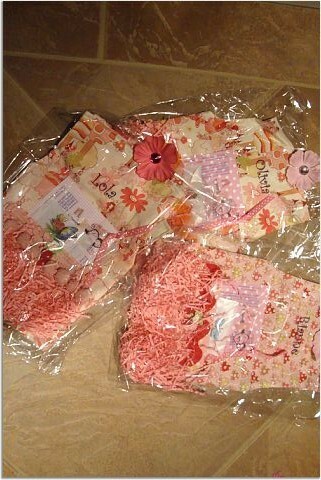 I embroidered each apron with the fairy princess’s name with the “recipe” invitations and carousel tokens tucked inside. The rest was up to me. 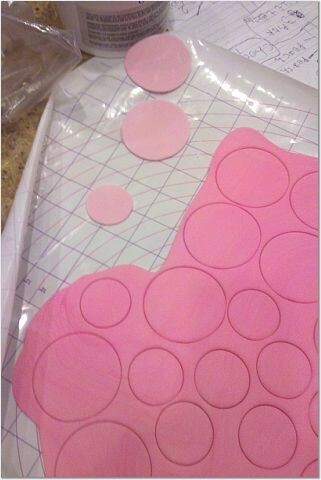 With the invitations out the door, I began making the bling for the cake. I made the fairies out of gum paste. 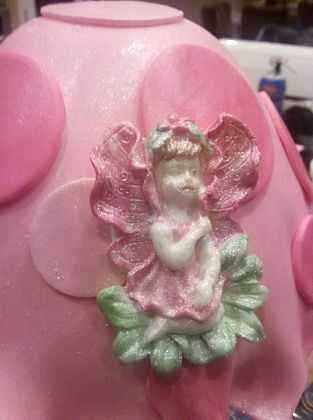 The fairies were formed in a silicone mold, frozen, dried and then hand painted and glittered for that extra magical touch. 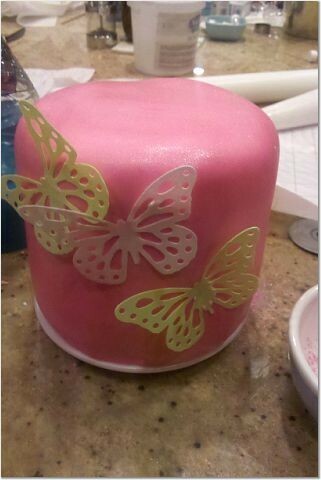 I used the Cake Cricut that my friend sent me for Christmas to make all of the butterflies. I do have to admit the finished product was beautiful, but getting there took a lot of patience. 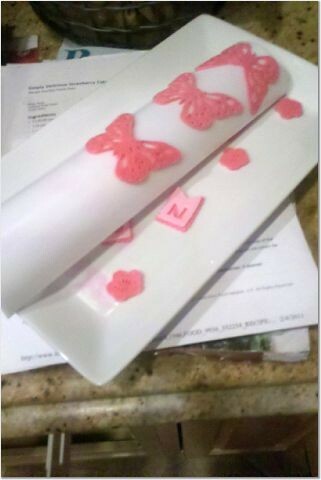 It is very difficult to find the right medium for the Cake Cricut. 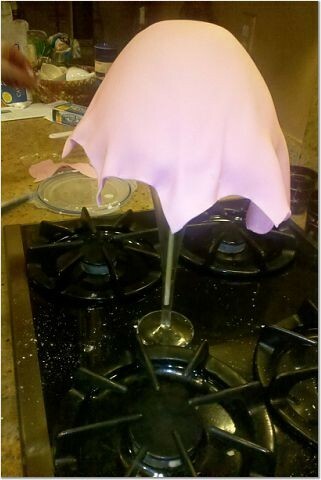 I tried the sheets that are sold with the Cake Cricut – most of the sheets were brittle and the butterflies I did get out of the Cake Cricut sheets never dried so some of them ended up breaking. I then tried gum paste and had a little better luck. I was able to get the name banner and a couple more butterflies, but I need more practice or a better medium to use with the machine. 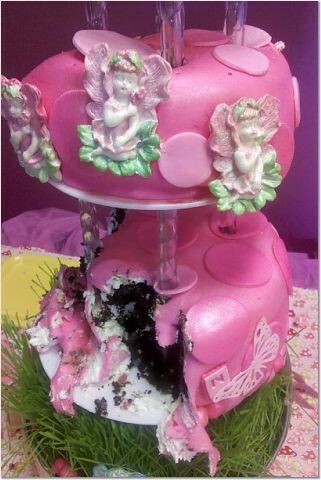 All of the cakes were baked and frozen just waiting for the pounds of butter cream and pink marshmallow fondant. 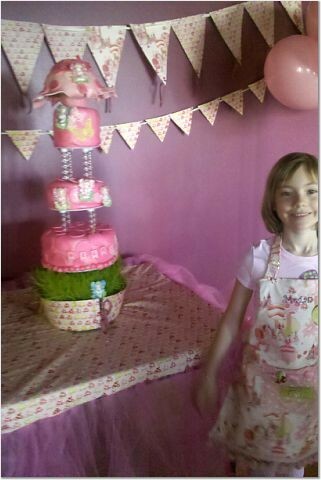 I have to admit I messed up on the layers of the cake flavors based on my daughter’s original design, but I did get final approval from my little designer. PHEW – crisis averted. Chocolate for the bottom layer, super sweet strawberry for the middle layer and cherry for the top layer. I love making the cherry cake as this was the first cake my mother ever made for my dad and I think I have had it as part of my daughter’s cake for at least 2 or 3 years – a great family tradition as my mother was an incredible baker and cake decorator. My sister arrived just in time to whip up the butter cream and crumb coat the cakes. I even had my hubby get involved with the fondant. Kneading the marshmallow fondant takes some big strong hands, so I always save this task for him. He may have grumbled a bit, but he obliged. My sister and I were up to our elbows in butter cream. 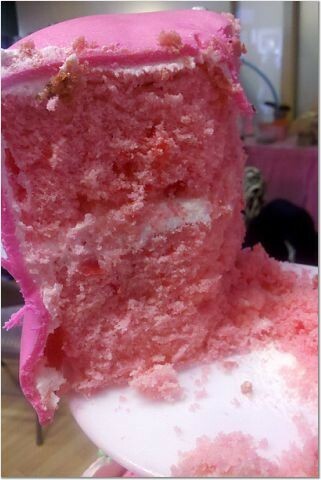 We frosted and frosted and then covered the butter creamed cakes with pink marshmallow fondant and pink marshmallow fondant dots. 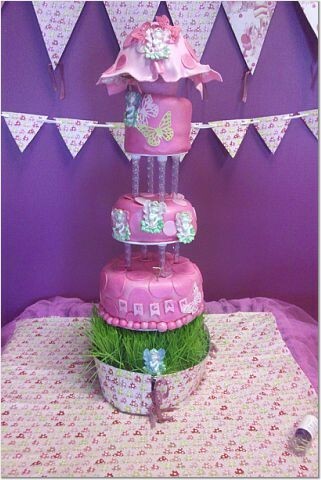 The toadstool on the top on the cake was formed from rice krispie treats and then covered in marshmallow fondant. I trimmed the edges with scissors. My sister and I liked the drapiness of the toadstool, so my sister placed champagne glasses under the edges to make them dry in a very whimsical fashion – SO CUTE. I had ordered some wheat grass for the bottom layer, because what is a toadstool without grass? We transported the cake and assembled it and, WA LAH, here it the finished product. It was a fantastic 7th birthday and a good time was had by all. Do you have whimsical toadstools in your garden? This is a great Spring Risotto. Even though it really isn’t Spring, we pretended tonight and made the risotto anyway. I like this risotto because of its creaminess and that it is fairly easy to make even though it is a risotto and requires some stirring. The marscarpone cheese and fennel make for a unique taste. The recipe is adapted from one I found from Ina Garten of Barefoot Contessa fame. Ina seems to really like citrus and related zests. Me, not so much. I have taken the zest completely out and the citrus juices down. I also cook it until it is a little more creamy (wet) than what is called for in the recipe. I tend to not like a dryer risotto, so just don’t add as much chicken stock if you would prefer it more dry. Heat the olive oil and butter in a medium saucepan over medium heat. 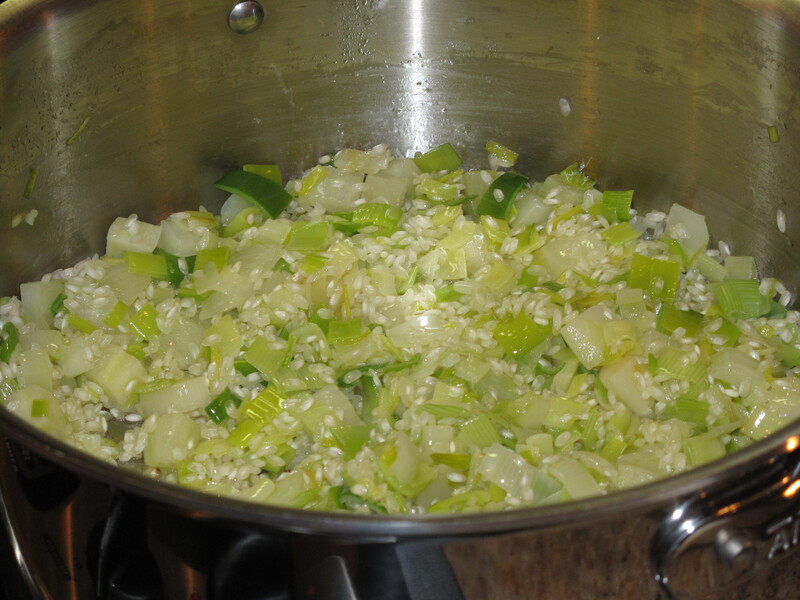 Add the leeks and fennel and saute for 5 to 7 minutes, until tender. Add the rice and stir for a minute to coat with the vegetables, oil, and butter. Add the white wine and simmer over low heat, stirring constantly, until most of the wine has been absorbed. Add the chicken stock, 2 ladles at a time, stirring almost constantly and waiting for the stock to be absorbed before adding more. This process should take 25 to 30 minutes. 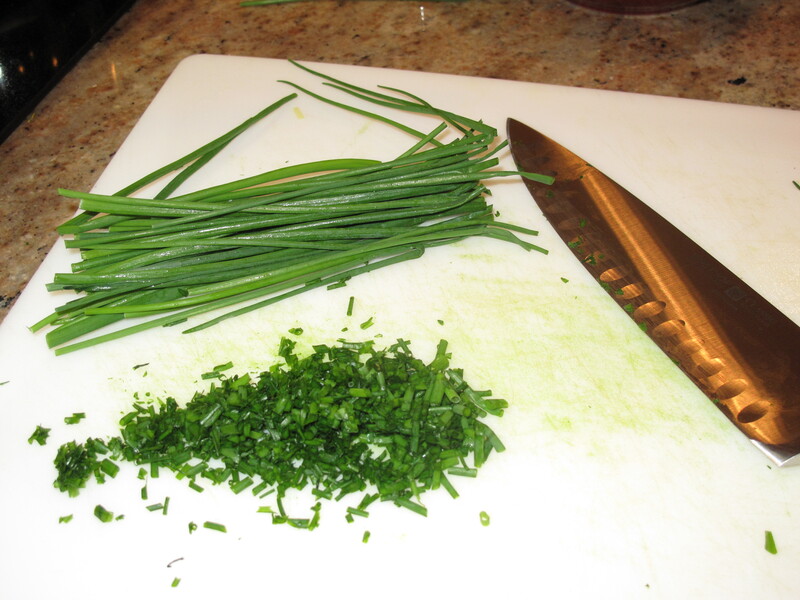 Meanwhile, cut the asparagus diagonally in 1 1/2-inch lengths and discard the tough ends. 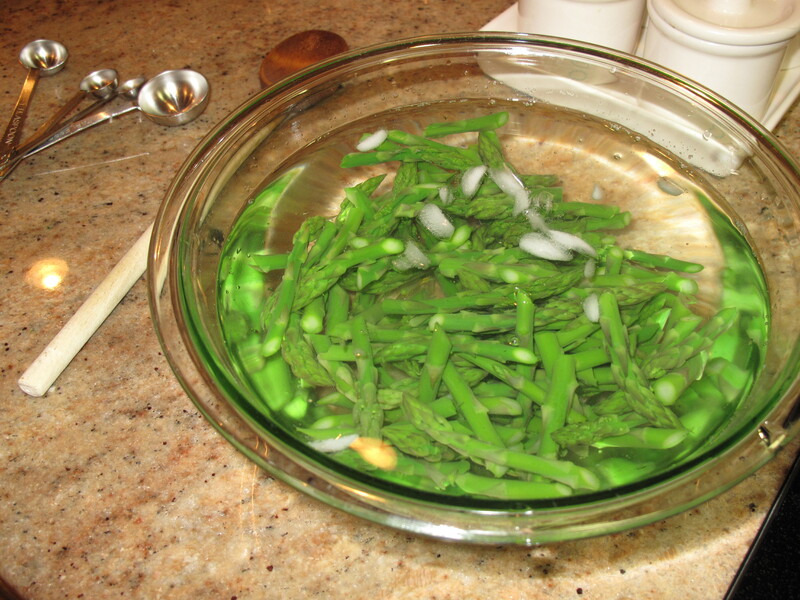 Blanch in boiling salted water for 4 to 5 minutes, until al dente. Drain and cool immediately in ice water. When the risotto has been cooking for 15 minutes, drain the asparagus and add it to the risotto with the peas, 2 teaspoons salt, and 1 teaspoon pepper. 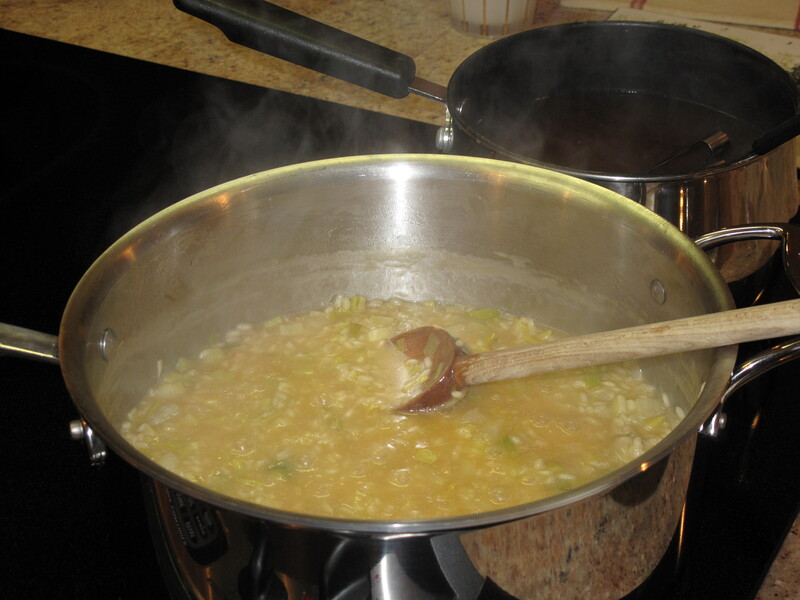 Continue cooking and adding stock, stirring almost constantly, until the rice is tender but still firm. We love to cook and we will be sharing more recipes over time. Tell us what you like to cook? This is JoJo again and it’s time for my journal. As a diva Yorkie, I like all things nice….and expensive….given as a gift….from my boys. Much to my surprise, I was told that a new treat was on its way to me and I was excited. What could it be? Diamonds, caviar, pearls, a new cashmere sweater to brave the cold? The list is endless. My suitor came in with something behind his back. Flowers….maybe red roses. BARK!! Well, to my horror, I was given a rawhide treat. You know, one of those leather logs that dogs chew on for hours on end. Absolutely not….no way. Go directly to jail; do not pass go; do not collect $200. Sniff….well it does smell good. Lick…..nice taste. Chomp….what have I got to lose? The end result was a treat I treasured. As with most things in our life, the simplest things are usually the best things. The things we remember and treasure forever. A gentle kiss from a lover, a hug from your child, a homemade Valentine, a bouquet of dandelions from your front yard. Yes, even a rawhide treat. Remember to keep it real and celebrate the simple things in life. Tell me what has been your favorite simple treat? This is my new Jump Start. What’s that you might ask? It is a grow light system that will enable me to grow seedlings from organic seed and then move the seedlings out into my garden. 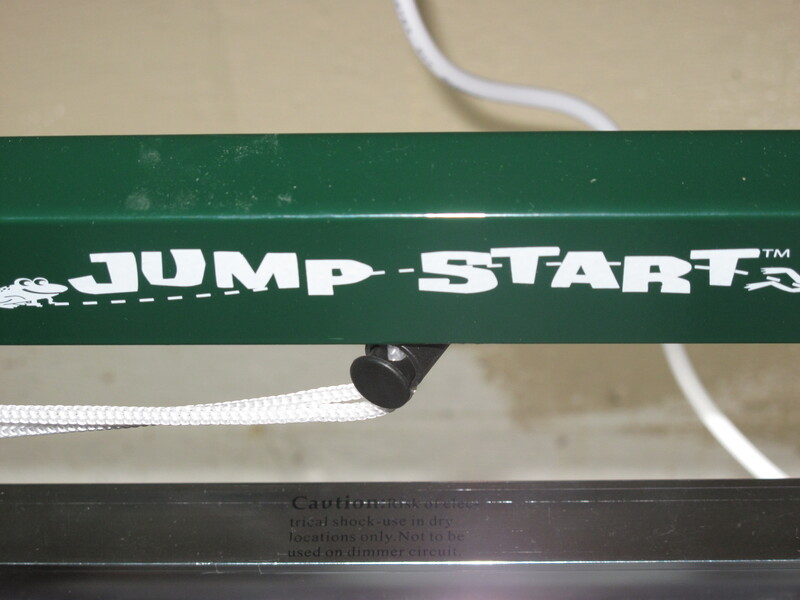 The Jump Start system combines an aluminum light stand with a 4-foot, single tube fluorescent fixture, adjustable to my seedling’s height, for an easy solution to grow my own plants. The seeds will be planted in flats and covered with acrylic domes to keep in the moisture and heat. When the seeds sprout, the domes will be removed and the light will be kept on about 14 hours a day at about 2 inches above the new sprouts until they are ready to be moved outside. 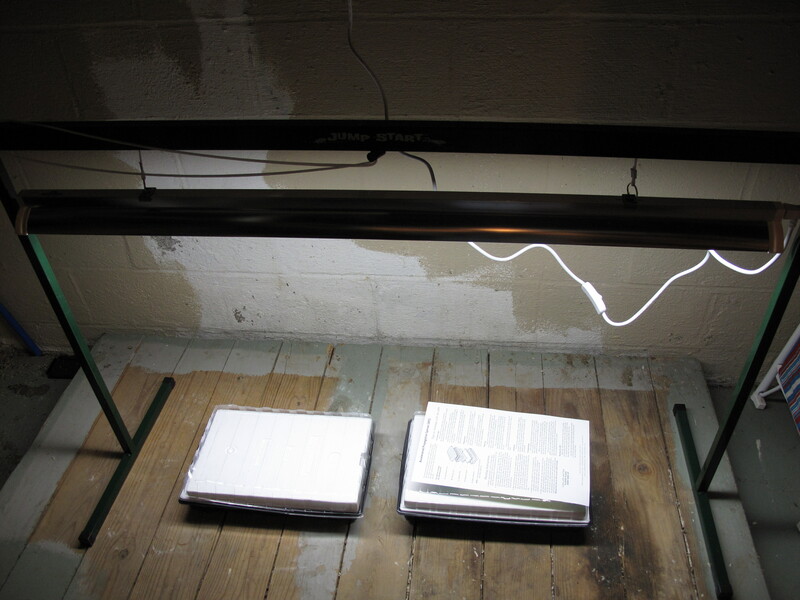 I’ll be growing tomatoes, cauliflower, eggplant, brussel sprouts and cabbage under the light. I’ve ordered the seeds and will start planting them in mid-March so that the plants will be able to be taken outside in mid-May when the danger of frost is over here in Connecticut. Talk about new beginnings…from seed to table. Let’s start “The Garden-2011”! What do you plant in your garden? This is Friday, February 18, 2011. Friday is a great day. We survive another week and hopefully have a few days over the weekend for some down time. Down time to do what we want and need to do. Time to re-connect, relax, re-energize, run errands and get in touch with ourselves, nature, our families and our friends. Fridays are great days to grab a loved one and dance. I dance to celebrate. I dance to blow off steam. I dance to get over bad times. Hell, I just like to dance! Some Fridays we want to dance hard and crazy and some Fridays we want to be romantic and slow dance with a loved one. In honor of Valentine’s Day this week, let’s start off with a slow dance. A big mushy slow dance…there is nothing better. Celebrate YOU….just dance. Tell me other songs you want me to add for upcoming Friday Dance Parties?